San Diego Police examine the spot where the window washer fell. Photo via OnScene.TV. A window washer plunged eight floors to his death from an East Village condominium building on Tuesday. 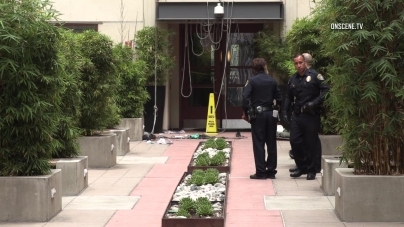 James Stinson, 61, was rappelling off the side of the structure in the 1100 block of J Street when he fell into a courtyard area about 8:45 a.m., according to police and the San Diego County Medical Examiner’s Office. Medics took the gravely injured Jamul resident to UCSD Medical Center in Hillcrest, where he was pronounced dead.